The Student Photography Competition is for all UBC students. 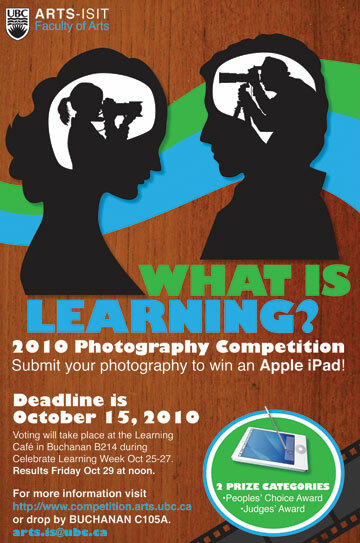 Submit your image on the theme, “What is Learning?” by October 15th. There will be two categories of awards – Judges Award & People’s Choice Award. Voting for the People’s Choice Award will be during Celebrate Learning Week on October 25-27, 10:00-4:00. Awards for both categories will be announced on October 29th at noon. Both winners will receive an Apple iPad. This event is open to UBC students, faculty and staff.